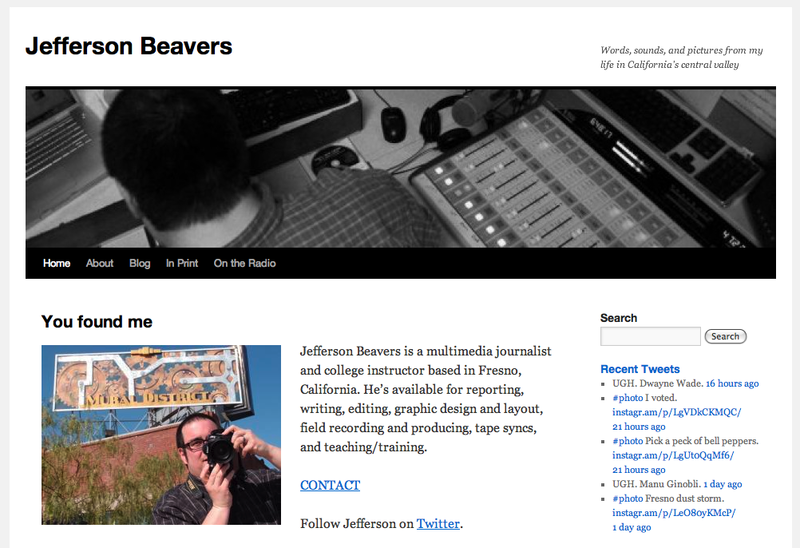 The current JeffersonBeavers.com landing page. My little website quietly celebrated its one-year anniversary on May 25, 2012. Since I first welcomed readers to my new site, I have posted more than 60 blogs in the past year. Some were reflections on my creative work, some were movie reviews, and some were lists of my favorite music and media. I’ve also posted a modest archive of my current radio stories. The whole site is definitely a work in progress, but I’m happy that I’ve been able to keep everything operating for a whole year. In the past year, I completed an internship with KQED Public Radio and have slowly but surely gathered experience as an audio producer. I’ve had three feature stories and one sound postcard air on The California Report program, and I’ve contributed field recording and production work to many other stories that have aired on KQED and NPR. I used a portion of my freelance earnings to put together my own multimedia production kit, and I’ve now got enough equipment to call myself a legitimate backpack journalist. My first year as a freelancer hasn’t been easy, but I’m still working at it. I spent a lot of time at Fresno City College in the past year, both teaching and taking classes. I taught one section of Journ 1 in each the fall and spring semesters. I also took three photography classes and one graphics class as a student, where I learned enough to get myself started with using a digital camera, Photoshop, and Illustrator. This fall, I’ll again teach one section of Journ 1 at Fresno City and I’ll also teach one section of Engl 1 at the Willow International campus in Clovis. It’s unlikely that I’ll have time to take photo classes in the next year, but I hope to continue taking photo walks. Thank you to my wife and to the many friends and colleagues who have given me unending support in the past year. For fear of temporarily forgetting someone, I won’t try to list everyone here who has encouraged me and inspired me. You know who you are! And I want you to know that your help means the world to me. Jefferson, it has been a pleasure and an honor to watch your work progress this year. Freelancing is not easy and I think you owe yourself a pat on the back and a deep breath. You’ve sold some stories, you’ve done writing/photo/audio and you’ve got a backpack full of great gear. What else can a reporter dream of?! Here’s to a second great year!